The Latvian Platform for Development Cooperation (LAPAS) has been working on the Sustainable Development Goals (SDGs) since 2014, when the stakeholder involvement in the post-2015 process took place. In 2014, LAPAS established the working group on the SDGs within the platform uniting active NGOs, UNESCO NC, and academia. This group aims to coordinate current projects and to mainstream the SDGs in the relevant activities. Since then, many awareness raising activities have been implemented to mainstream the SDGs – such as tax justice, fast fashion, food security and many more. These include the annual Global Education Week where thematic movies are screened, and the newspaper “The World Becomes Better Place” distributed and relevant workshops organised in cooperation with more than 60 regional partners – schools, youth centres, libraries and others. Special attention has been paid to the training of youth and private companies. To glocalize the global issues locally, LAPAS has gathered 34 people stories (on each goal) on how the SDGs are being implemented in the work of CSOs, local governments, research institutions and small enterprises. This approach was multiplied at the Baltic level and with the support of the NCM all three Baltic countries gathered best practice cases – 17 for each country. 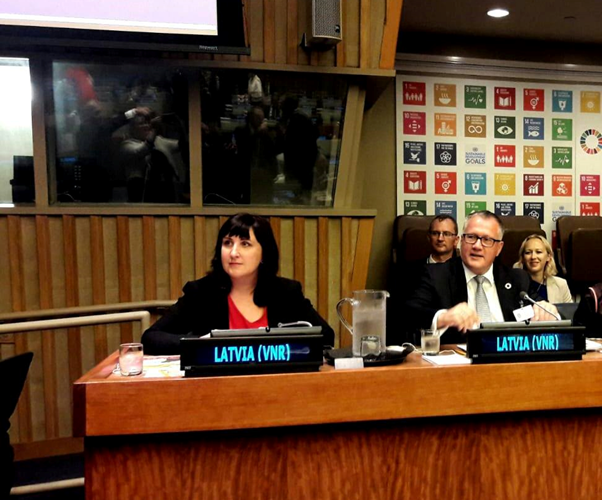 In 2018, Latvia presented its Voluntary National Review (VNR) at the HLPF and with the support of Forus LAPAS, which prepared a CSO Spotlight Report on the Implementation of the SDGs in the national level in Latvia, participated in the HLPF, including a side event by giving a presentation together with the Minister of Economics. The experience was written up in in a publication “Voluntary National Review: Connector. Case of Latvian CSOs” – pre-VNR process, VNR and post-VNR. Since the VNR process, LAPAS continues to work actively with all stakeholders to establish a multi-stakeholder coalition and the integration of the SDGs in a new National Development Plan. All materials are available at www.lapas.lv (Global Goals). The Latvian Platform for Development Cooperation (LAPAS) was established in 2004. The same year, when Latvia joined the European Union. LAPAS unites Latvian NGOs, which believe that Latvia’s transition experience to a democratic market economy can be useful to others. LAPAS also promotes NGO participation in development cooperation and coordinates Latvia’s efforts in development education.